It has now been over a month since the devastating earthquake in Yushu, the capital of Yushu County in Qinghai Province (see my original post here). In that time, many people have stepped up and helped out, and the current situation seems to be fairly stable. Thank you to everyone who donated to relief efforts. This seems like perhaps a good time to highlight the efforts of the region’s monastics. Despite the fact that many of their own monasteries were destroyed, teams of monks and nuns provided much of the early relief manpower, digging out survivors and offering solace to the dead and bereaved. I have often heard complaints that Tibetan monastics do not engage in enough social justice work, so it was particularly gratifying to see so many helping in Yushu. Additionally, it is important to acknowledge the Chinese government’s efforts in Yushu. From most accounts the government’s efforts have been robust and dedicated, especially considering the the difficulties involved in getting tons of relief supplies across a thousand miles of damaged, high-altitude roads. The New York Times ran a series of articles (on April 17th, 18th and 23rd) discussing the tension between the monks and government officials, but I have heard from people on the ground that this tension was not as pronounced as they reported. Woman in a home built from cardboard and bricks from earthquake ruins. Courtesy of Tamdin Wangdu. Now that the immediate needs of residents have largely been met, attention has turned to reconstruction. Tamdin Wangdu of the Tibetan Village Project has reported that government efforts are focussed on long-term reconstruction, a project which could take several years to complete. 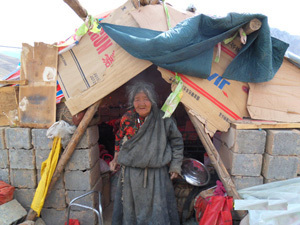 In the meantime, many of the families who live in Yushu are still homeless, and could still use our help. Both the Tibetan Village Project and Plateau Perspectives continue to provide much needed aid in the region, supplying water filers, all-season tents and the training required for individuals to find new jobs. All of this without the bureaucracy that can slow-down and hinder government efforts. Please take a moment to look over their websites, and consider donating. Small amounts can still make a big difference. There is no hope of finding anyone else alive and basic needs for food have been met, but in other ways the situation the ground is unfortunately rather different from what has been reported in the news. In particular, there is still a shortage of tents to provide sufficient shelter for all of the people who are homeless. This may have been overlooked, since the official response locally, and also the international response, is now focusing on longer-term relief efforts. This is also necessary, as is the work of NGOs, social organizations and others in the area who are looking to focus on mid-term social needs, such as rebuilding businesses, providing training and facilitating the flow of information. Meantime, however, shelter is by far from adequate. In short, Yushu needs more tents. If you have any questions, please feel free to e-mail me, and I will do my best to answer, or at least to pass the question along to someone who might be able to answer it. Thanks to Robbie Barnett, Gray Tuttle, Clay Goforth, Brenton Sullivan, Tamdin Wangdu and Losang for providing information on relief efforts. As many of you probably know by now, an earthquake struck northeastern Tibet during the early morning hours of April 14th. The earthquake had its epicenter about 30km from Jyekundo, the capital of Yushu County in Qinghai Province, China. (Click here for an interactive map, courtesy of THL) While the area is sparsely populated, the reports I’ve seen have indicated that casualties and damage are both pretty extensive. The area is populated primarily by Tibetans, andmany individual family homes have collapsed (originally it was reported that these were mostly built with traditional adobe construction, though I have now heard that most were, in fact, built of cinder blocks with pre-fab concrete roofs). As with the 2008 Sichuan earthquake, many schools collapsed. Currently, over 2,000 people are listed as dead, with over 12,000 injured. The following is an excerpt from a blog post by Losang, of Plateau Perspectives. The full report is well worth reading and has several striking photos. My family and I were in our 3rd floor apartment building when the earthquake hit. There was a smaller earthquake (around 4.7) that occurred around 4am and neither my wife or I could get back to sleep. When the big quake hit, my wife was using her computer while our younger son Norbu (18 months old) was playing in the living room. Tsering, our older son who is 3 years old, was still asleep in the back bedroom. … Norbu flew across the room when the quake hit. My wife was also violently thrown to the ground. Everything in our apartment began to be tossed around, breaking when it hit the walls or floor. I ran to the back bedroom and grabbed Tsering and grabbed him as my wife grabbed Norbu off the floor. Together, we ran to the door. I paused long enough to grab my shoes, coat and a bit of money. I opened the door and one of our Tibetan neighbors assisted us in carrying Tsering down the 3 flights of stairs to the ground floor. All of us were in just our pajamas. I was the only one of my family who managed to get shoes. The Associated Press is reporting that large convoys of relief material is finally making it to Jyekundo, just in time for Hu Jintao’s arrival. The New York Times has also been emphasizing the role that monks have played in relief efforts, though I have heard that their report on tensions between monks and police may suggest more tension than there actually is. The following groups still need assistance. As the relief effort shifts to rebuilding, it is more important than ever that local NGOs and others who know the people and landscape have the resources they need to be effective. Snowland Services Group is a Tibetan NGO currently on the ground in Jyekundo. While their own operations were hard hit during the earthquake, and at least one staff member was killed, they are seeking to provide water, food, tents, clothing and bedding. Recently, they have organized a relief consortium in Xining called Yushu Earthquake Response (YER). Other members of this group include Shem Women’s Group [click here for my earlier post on this group], Pentok Institute, Sanchuan Fazhan Cujinhui, Tsong Ka Charity Association and Xiangcun Zhiyou. The organization does not have its own website, yet, but funds donated to the Tibet Village Project will be routed to them, through existing contacts. Plateau Perspectives is a western NGO also based in Jyekundo, and may be the only western NGO authorized to distribute aid so far. They have many years of experience and contacts in the region and already have gotten at least one team of doctors into Jyekundo, with the government’s blessing. They also have the most fully developed web-presence of these small groups, yushuearthquakerelief.com, a site which now includes video taken just a few minutes after the earthquake hit. Donations cane be made through this site. Rokpa is an international NGO that runs a school in Jyekundo. I have heard that all of the children survived, though one teacher was killed and the school buildings are in rubble. They are also accepting donations for earthquake relief, though they do not yet have a dedicated website set up. Donations can be made through their general website rokpa.com, and should be noted as being for earthquake relief. Sichuan Quake Relief is an organization founded to provide relief efforts after the 2008 Sichuan Quake, who have now turned their attention to the Yushu Earthquake. They have managed to get beyond the town of Jyekundo to reach some remote villages, and have found them devastated, with no relief in sight. Donations can be made through their clear and well organized website, sichuan-quake-relief.org. Gerald and Elena are a pair of foreign workers teaching Tibetans in Xining, the provincial capital. As of April 15th, they had organized at least one truckload of supplies, including blankets, water, food and tents. The total bill for the supplies came to just over $700; proof that small donations really can help. They can be reached through Gerald’s e-mail address: gjroche@gmail.com. In my original post, I said that foreign NGOs operate under strict regulations in China, so it was not feasible to donate to large groups like the Red Cross. I have since noticed that both the Red Cross and Mercy Corps are soliciting donations for Yushu Earthquake relief, so presumably they are planning to put relief operations in place as soon as they can. I’m still not sure what kind of red tape they will have to deal with, however. If you are interested in donating to either of these groups, click here: Red Cross, Mercy Corps. Thanks to Robbie Barnett, Gray Tuttle, Clay Goforth, Brenton Sullivan, Losang and Tamdin Wangdu for bringing these groups to my attention. In honor of International Women’s Day, I thought I would try to call some attention to the Shem Women’s Group [ch: 祥母慈善协会]. This organization, run by a group of four Tibetan women, encourages women to design, organize and execute development projects in their individual communities. Shem thus makes a direct impact on the lives of villagers by providing needed services such as water-works, solar electricity and plumbing. Perhaps more importantly, however, Shem challenges Tibetan gender stereotypes. While Tibetan gender roles may not be as rigid as those in other parts of Asia, there are still deeply held ideas regarding the spheres of activity appropriate for men and women. Speaking generally, women are responsible for most household labor and chores, while men are responsible for taking care of the business side of things. In practice, this means that women do most of the heavy lifting, while men take credit for a family’s prosperity. Being female is widely regarded as an inferior birth, the result of negative karma, and women are generally seen as less capable than men. By encouraging and enabling women to design and perform projects in their home villages, the Shem Women’s Group is forcing other villagers (particularly male villagers) to recognize that women are capable of undertaking and completing major projects outside the home. Last week, Lhamotso, one of the group’s directors, gave a talk about the group at UVA, and her experiences speak to the effectiveness of this approach. When she first started working with Shem she was ridiculed and her family was pressured to make her stop. After completing a few projects, however, she found herself the recipient of social acclaim and approval. Now, she reported, the village headman now comes to her house to speak with her. Another person told her father that she was, “better than a son.” Clearly the Shem Women’s Group’s approach to challenging Tibetan gender norms is having an effect. For more information on this group, or to donate to their effort, please click here. I’m sure the Shem Women’s Group is not the only group out there working on gender equality issues in Tibet, but having just attended Lhamotso’s lecture, it is fresh in my mind. If anyone reading this knows of other groups working on this, please let me know via the comment box below.